Acquisition is the first step in creating viable wildlife linkage across the valley. (Palo Alto, Calif.)—Peninsula Open Space Trust (POST) announced today the purchase of a 30-acre property in the northern part of Coyote Valley, on the southern end of the San Jose City limits. POST purchased the property for $5.86 million from the Panattoni Development Company. The property sits just west of the Monterey Highway and is proximal to Fisher Creek and Tulare Hill in what could be the most functional and viable passage for wildlife to cross the Coyote Valley and move between the Diablo and Santa Cruz Mountain ranges. This map showcases the core habitat areas (in green) that the Coyote Valley connects, according to the Bay Area Critical Linkages report. 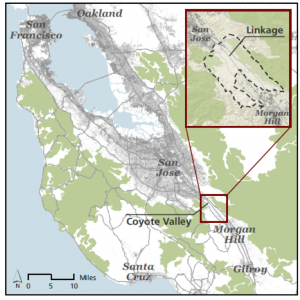 Report found conclusive evidence that if properly conserved and restored, the Coyote Valley can provide significant benefits such as a variety of rare wildlife habitats, a regionally significant 1,000-acre freshwater wetland complex, expansive groundwater storage, and opportunities for agriculture and public recreation that will benefit the entire Bay Area. “The Authority and our conservation partners such as POST, share a vision to protect and restore essential areas within the Coyote Valley that are vital to ensure ecological connectivity, health and resilience in the face of a changing climate,” said Andrea Mackenzie, General Manager of the Open Space Authority. One hundred years ago, the Coyote Valley was one of the largest freshwater wetland complexes in the Bay Area. In 1916, it was drained to accommodate agricultural production in what was then known as “the Valley of Heart’s Delight.” Half a century later, it became part of the bustling Silicon Valley. But plans for widespread high-tech campus development, warehouses and data centers have not taken hold, providing the opportunity for 18 local conservation planners and scientists to study the area for its current day ecological potential and to publish the Landscape Linkage Report. POST is a leading private, nonprofit land trust that protects and cares for open space, farms and parkland in and around Silicon Valley. Since its founding in 1977, POST has been responsible for saving more than 75,000 acres as permanent open space and parkland in San Mateo, Santa Clara and Santa Cruz counties. Visit openspacetrust.org for more information.